Stop what you are doing and go see Star Trek. I am not playing, STOP and go see it now! Remember when I told you about how I was Crushin on Captain Kirk? Well I still am, only now it has been bumped up a notch or ten. Thanks to great writing, (Roberto Orci and Alex Kurtzman) directing, (J.J. Abrams) and not to mention acting. What can I say; thanks to Chris, I am now Pine-ing for Kirk. I first mentioned Chris here when I reviewed Bottle Shock, which was a good movie about our favorite thing, wine. Now that he has portrayed one of my favorite childhood loves, and done it well, I like him even more. Other preformances included Zachary Quinto as Spock. 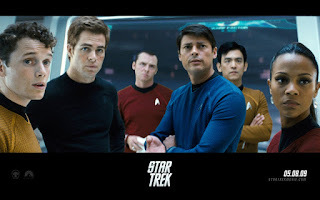 You may reconize him from the TV show Heroes, Simon Pegg as Scotty, and John Cho as Sulu. It's like a nerdy smorgasboard of yummy. 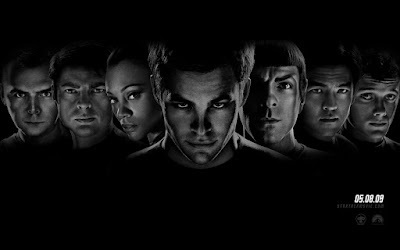 However, nerd or no, if you like action, hot guys, or pretty girls, (Lt. Uhura), you'll like Star Trek. For those of you who don't like the film, check out this report.